The ARHS-ACT is fast becoming the 30 class capital. Not only is the museum located in the countries capital, Canberra, but we are also the caretakers of several 30 class steam locomotives, 3016 and 3102 both of which started life as tank locomotives on the Sydney suburban network, before being converted to tender engines when they were replaced by the electric red rattlers in the mid 1900's. As if that is not enough, we have just been gifted 3013 by David Burke, which will be moved to Canberra in the coming months from Cowra, where it has been under a protracted, and unfinished restoration. If you visit the museum, you will also see another 30 class tank engine, 3112, though a fence on the north of the property. Not often used these days, and in need of some routine maintenance, 3112 is privately owned, and has been used occasionally by the museum for tourist work. 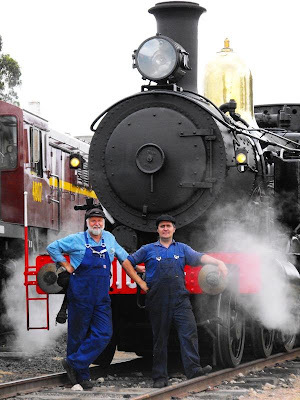 3013 was recently gifted to the society by David Burke, and will soon arrive in Canberra. It is currently in many pieces and located in the Cowra roundhouse, where it has been under the care of the Lachlan Valley Railway. The loco will be surveyed when it arrives to determine its condition and set a direction for its reassembly and restoration. The photos below give some idea of the task ahead. 3016 was built in 1903 and despite its age has recently been providing the lions share of the motive power required by the museums train movements. Originally a tank loco, it was converted to a tender loco in 1930. At some stage, the loco was modified to include superheating, meaning also an extended smokebox. The loco was purchased by the museum in 1977 when it was placed on display before being returned to service in1989. 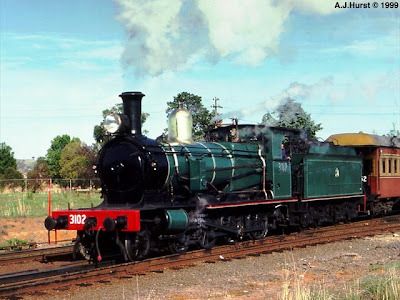 3102 was the second steam locomotive to be acquired by the ARHS-ACT(the first was 6029, which at the time was on loan from the National Museum), and was rescued from an imminent appointment with the scrappers torch by a few of the members who had been given a week to raise $5000 and to relocate the loco from somewhere in Sydney after a previous arrangement for the locomotive fell through. 3102 is a Saturated loco, and was nicknamed "the Mouse" because of its gentle characteristics and soft notes when in steam, 3102 for many years was the work horse of the Museums rail operations. Currently in storage, and awaiting restoration work, including some major boiler work, 3102 is looking rather sorry for herself but should soon be returned to her former glory as seen above.